The Sign of the Kiwi was constructed in 1916-1917 as one of a number of rest houses planned for the Summit Road scheme of Henry Ell. The great pre-occupation of Harry Ell, a politician and tenacious social and environmental campaigner, was the promotion of a summit road from Godley Head to Akaroa, providing public access to all parts of the Port Hills. Resthouses would be distributed along the route, offering refreshments and simple accommodation. The Summit Road Association was founded by Ell to foster the objective in 1909, and although the ambitious project was incomplete at the time of his death in 1935, he had seen a substantial portion of his scheme to fruition, including the establishment of four resthouses, of which this is one. Historical and social values that demonstrate or are associated with: a particular person, group, organisation, institution, event, phase or activity; the continuity and/or change of a phase or activity; social, historical, traditional, economic, political or other patterns. The Sign of the Kiwi has high historical and social significance as part of the Summit Road scheme, for its association with Henry Ell - politician and social and environmental campaigner - and as evidence of the emergence of new habits of leisure in the early years of the 20th century. The Sign of the Kiwi was constructed in 1916-1917 as one of a number of resthouses planned for the Summit Road scheme of Henry Ell. The great pre-occupation of Harry Ell - politician and tenacious social and environmental campaigner - was the promotion of a summit road from Godley Head to Akaroa, providing public access to all parts of the Port Hills. Resthouses would be distributed along the route, offering refreshments and simple accommodation. The Summit Road Association was founded by Ell to foster the objective in 1909, and although the ambitious project was incomplete at the time of his death in 1935, he had seen a substantial of his scheme to fruition, including the establishment of four resthouses. The Sign of the Kiwi was a tribute to Ell's persistence, having been built with the donated assistance of many firms and individuals. From 1920-1926 he and his wife lived at the property, with Ell acting as caretaker and Mrs Ell running the tea rooms. Economic depression, war and further social change eventually rendered most of Ell's resthouses redundant. The Sign of the Kiwi closed in 1945 and was converted in 1953 to a caretaker's (later ranger's) residence with a small shop. In 1984 John and Lindsey Sigglekow and family moved in, with John serving as ranger and Lindsey taking over the shop. The Sigglekows' relocated to a new purpose-built ranger's residence at the rear in 1991, and the Sign of the Kiwi was restored and reopened as a tearooms in 1996. Lindsey Sigglekow continued to run the business until 2009. 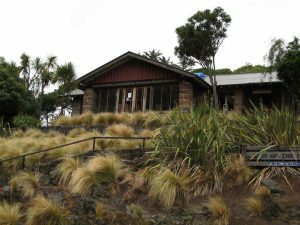 The former resthouse remained a popular destination until it sustained damage in the Canterbury Earthquakes of 2010-2011. Cultural and spiritual values that demonstrate or are associated with the distinctive characteristics of a way of life, philosophy, tradition, religion, or other belief, including: the symbolic or commemorative value of the place; significance to Tangata Whenua; and/or associations with an identifiable group and esteemed by this group for its cultural values. The Sign of the Kiwi has high cultural significance as evidence of new modes of leisure and recreation emerging in the early 20th century. The 'healthy body healthy mind' credo entered into popular culture at this time, and in association with the establishment of regular holidays, saw larger sectors of the population pursuing fresh air, exercise and new horizons. Architectural and aesthetic values that demonstrate or are associated with: a particular style, period or designer, design values, form, scale, colour, texture and material of the place. The Sign of the Kiwi has high architectural and aesthetic significance as an exemplary Arts and Crafts bungalow, a design of well known exponent of the style Samuel Hurst Seager, of (at the time) the firm Hurst Seager and McLeod. Samuel Hurst Seager came to New Zealand with his parents in 1870, and took over the family construction business following the death of his father in 1874. After working for leading architect Benjamin Mountfort and studying architecture at Canterbury College and in London, he established his career in Christchurch with his prize-winning entry for the new municipal building in 1885. Seager was an innovative designer, at the forefront of architectural and planning theory and practice in New Zealand in the decades either side of 1900. He believed particularly in the potential of good design to change and improve society, and wrote prolifically on town planning, architecture and the built environment. Although he designed houses of many styles and sizes, including some of the city’s most notable turn-ofthe- century mansions, he is remembered particularly for introducing the radical informality of the bungalow style to New Zealand with his house for John Macmillan-Brown in Cashmere in 1898. Influenced by the new Garden City concept, Seager’s The Spur development took his ideals a step further and introduced the country’s first informal bungalow landscape. This manifested two strands of his philosophy – his search for an indigenous architectural expression, and his desire to promote new ways of living through architecture. Two decades on from The Spur development, the Sign of the Kiwi also expresses the development of Seager's philosophy, including truth to materials, appropriateness to landscape and handicraft. The simple low volcanic stone building blends into its hill-side surroundings, with the stones being used in their natural forms and reshaped as little as possible. Organic materials are used throughout with minimal modification, although there are artistic touches with inscribed beams and leaded windows. Inside, the stone walls were unlined; ceilings were dark-battened white plaster. The chunky Arts and Crafts-style tearoom furniture was also Seager's design, although none remains extant. The two other Seagerdesigned resthouses, the Signs of the Bellbird and the Packhorse, whilst products of the same design philosophy, were much more prosaic structures. Alterations were undertaken to the building in the 1950s when the bunkroom and scullery became the new kitchen, bathroom, laundry and hallway, while the kitchen became the bedroom and lounge. The porch was enclosed to create the shop, while the tearoom became the backshop, bedroom and hallway. A new ranger’s residence was constructed adjacent to the building in 1991. Also in the 1990s, a new toilet and first aid block was constructed. In 1995 the shop counter was removed, replica entry doors were installed and a commercial kitchen was put in. A shop counter from the old Victoria Park Tearooms was installed and the building opened the following year, once again as tearooms. The Sign of the Kiwi was damaged in the 2010-2011 Canterbury Earthquakes. Repair and strengthening have not yet taken place. Technological and craftsmanship values that demonstrate or are associated with: the nature and use of materials, finishes and/or technological or constructional methods which were innovative, or of notable quality for the period. Contextual values that demonstrate or are associated with: a relationship to the environment (constructed and natural), a landscape, setting, group, precinct or streetscape; a degree of consistency in terms of type, scale, form, materials, texture, colour, style and/or detail; recognised landmarks and landscape which are recognised and contribute to the unique identity of the environment. Archaeological or scientific values that demonstrate or are associated with: the potential to provide information through physical or scientific evidence an understanding about social historical, cultural, spiritual, technological or other values of past events, activities, structures or people. The Sign of the Kiwi and its setting are of archaeological significance because they have the potential to provide archaeological evidence relating to past building construction methods and materials, and human activity on the site, including that which occurred prior to 1900. The Sign of the Kiwi is of overall high heritage significance to the Christchurch district including Banks Peninsula. It has high historical and social significance as part of the Summit Road scheme, for its association with Henry Ell - politician and social and environmental campaigner - and as evidence of the emergence of new habits of leisure in the early years of the 20th century. The building has high cultural significance as evidence of new modes of leisure and recreation emerging in the early 20th century. The building has high architectural and aesthetic significance as an exemplary Arts and Crafts bungalow, a design of wellknown exponent of the style Samuel Hurst Seager. The building has high craftsmanship significance for the quality of its execution. The building has high contextual significance as one part of the legacy of Ell's Summit Road scheme, the surviving elements of which also include three other resthouses: the Signs of the Bellbird, Packhorse and Takahe, the Summit Road itself, and various reserves along its course. The building and its setting are of archaeological significance because they have the potential to provide archaeological evidence relating to past building construction methods and materials, and human activity on the site, including that which occurred prior to 1900. PLEASE NOTE THIS ASSESSMENT IS BASED ON INFORMATION AVAILABLE AT THE TIME OF WRITING. DUE TO THE ONGOING NATURE OF HERITAGE RESEARCH, FUTURE REASSESSMENT OF THIS HERITAGE ITEM MAY BE NECESSARY TO REFLECT ANY CHANGES IN KNOWLEDGE AND UNDERSTANDING OF ITS HERITAGE SIGNIFICANCE. PLEASE USE IN CONJUNCTION WITH THE CCC HERITAGE FILES.